Confronting compliance issues head-on saw the first round of Chain of Responsibility (CoR) training sessions being rolled-out this week by the turf industry’s new TurfPlus® Integrated Management System. 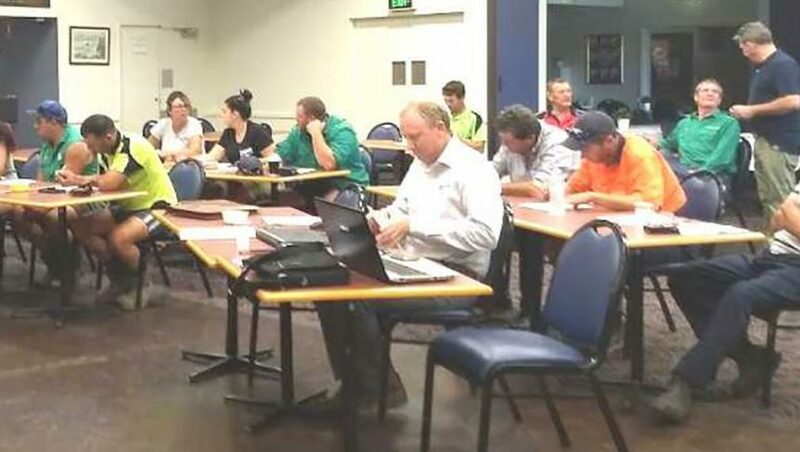 Around 20 turfgrowers, their management personnel and key staff attended the course, with all successfully gaining Australian Government ‘Myskills’ training certification and attainment of the Transport and Logistics BlueCard. Participants were said to be fully engaged in what was described as a very knowledgeable and practical presentation that was delivered by TurfPlus® partner, registered training organisation (RTO) operator Ian Pendered. Speaking after the course, TurfPlus® General Manager John O’Brien said how fortunate they were to learn from someone with the experience and delivery skills of Mr Pendered. “There was certainly plenty of material with examples growers could relate to,” said O’Brien. “With such a background in transport for years, then his work with TruckSafe®, and then more recently with his own compliance operation; it was great to get practical insight and learning into these latest Chain of Responsibility issues”. Chain of Responsibility or CoR is the practical application of the National Heavy Vehicle Regulator (NHVR) and the changes in legislation that came into place in October last year. The new laws now place CoR in the same levels of responsibility in the workplace as Work, Health and Safety (WH&S) laws and in particular, hefty increases in fines and penalties for those not having measures in place. “Turf producers are not immune to these new laws and in reality, they are probably more exposed than other heavy vehicle operators,” Pendered explained on the day. “The average transport operator might just have a couple of trucks and is generally across this stuff . . . whereas your turf operation could have half a dozen heavy vehicles running around with differing drivers and varying loads. We’ve seen it over the last few months when these guys are busy; it’s quite full-on. “Now when there’s so much happening in every direction; what could possibly go wrong?”, he questioned his audience with a fair degree of sarcasm. The best direction for training in the CoR space has been something the crew at TurfPlus® say they have been working on for a while, in order to come up with the right approach. “One of the main things with this new legislation is that it now lines up with safe work laws. Putting it bluntly; if you’re not familiar with the new laws and don’t have some kind of CoR management process in place, then you’re actually in breach of the law,” says O’Brien. “In developing the appropriate training, we worked with a number of specialist technical and legal transport advisors and the consistent message was that growers – and all staff involved with transport operations – needed to become familiar with the new legislation and the best way to demonstrate this was through something like the MySkills course. “So when delivered by our RTO through Mr Pendered, the TLIF0001 and Bluecard courses provide the awareness that’s necessary and formally recognised by Government,” he goes on to say. The CoR training session was the first in the TurfPlus® program’s rollout nationally, with a number of similar events planned over coming months. TurfPlus® claims to offer more than just being a compliance program, branding itself as an Integrated Management System that caters to turfgrowers needs, right along the chain of production. “We’ve got a solid compliance and accreditation program that covers five main management areas including; WH&S, CoR, Environmental Management (EMS), Quality Assurance (QA) and Human Resources / Industrial Relations (HR/IR). “So TurfPlus® as a whole gives our turfgrower members the advanced tools and training to achieve compliance and best-practice in these areas . . . there’s nothing out there that that compares to such an integrated management system for growers,” O’Brien states. What they also say sets TurfPlus® apart from other programs is its cloud-based heart that links all the components together to take it far beyond what paper-based systems can do. The online nature of the program allows for everything to be always up-to-date and keep growers abreast of the latest laws and legislation. The combination of training and technology is something the TurfPlus® system is continuing to develop with new features already on the horizon. ‘Our technical partners including telemetrics specialists have incredible tools for growers ranging from back-to-base live-reporting and even geo-fencing options for fuel-tax-credit benefits,” says O’Brien. Possibly the most cutting-edge component coming for Turfgrowers in the future is in the area of Quality Assurance. TurfPlus® says they are currently working with their digital specialist partner GrowEQ to investigate how blockchain could form part of a digital solution for improving operations and supporting growers over the entire supply chain. “It’s an exciting development and we’re confident that such technology will one day underpin the integrity of an accreditation program like TurfPlus®,” OBrien explains. “There’s an Ethereum blockchain spin-off looking promising that we’re examining for the right fit as to transparency, efficiency, and trust to farmers and end-users. O’Brien says how the TurfPlus® program captures and stores data already, so they’re looking to back that using blockchain technology to provide transparency in an immutable and verifiable manner along the chain. “We can then integrate physical, digital and blockchain assets to see the entire turf-production process. “Key elements like varietal integrity, provenance, production, chemical-use and even harvest through to delivery-information can all be digitally verified,” he says. TurfPlus® says that these technologies will help them create safer, more compliant operations, where growers can realise greater efficiency, profitability and sustainability into the long-term. “This is an incredible suite of tools that we’ve bought together to create a solid accreditation and training system, with growers and customers equal beneficiaries – it’s quite unique to the industry,” he concluded. The TurfPlus® program is currently taking its next round of applications to commence training in coming months and any enquiries can be made at admin@turfplus.com.au or phone 1300 094577.